Find out how to publish pages that link to a specific asset within the campus CMS. 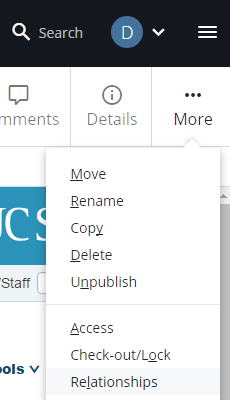 When you update a shared block or move a page, you will see updates in the CMS, but these changes won't appear on pages until they are published. You can see a list of pages that use a specific shared block or use an internal link to an asset. Navigate to the shared block or asset in question. You will see the Relationships window. From here you can link to the individual relationships, see when they were last modified and publish selected (checked) relationships or all of the,. Follow the instructions above to open the Relationships window for your asset. it means that this file (or a folder that contains this file) has publishing disabled. Check with your fellow SMEs and/ or site manager for the reason publishing was disabled before you override it and turn publishing back on.